Walking from Langada to the small church of Stavros (via Agios Theologos) is one of the most scenery and beautiful routes on Amorgos island. To master the trail to Stavros we recommend hiking boots and no acrophobia! There is a narrow cliff path between Theologos and stavros! Take care on windy days! Bring enough water with you! Download GPX/KMZ file from the widget right beneath. Starting at the parking lot in Langada, you can go there by bus, car or scooter, quite soon you get to a concrete road, which descends in the direction of the blue dome of Panagia Epanochoriani. After 3 minutes there is a junction: the road on the left goes down, into the valley. You have to take a right and you thus continue on the concrete road, which turns into a staircase. Again 5 minutes later you pass a rocky trail off the left and you then get to another junction: on the left there is a concrete trail heading straight to Panagia Epanochoriani, on the right there is a sign to Agios Theologos and Stavros. Take the path to the right. At first it is nicely paved, but later on it gets more difficult because there are many loose stones. Sometimes, however, the trail goes up via a beautiful brick staircase. You have great panoramic views on Panagia Epanochoriani and behind you also on the island of Nikouria. After about 10 minutes, at an altitude of 300 meters, the trail gets narrower and also flatter, but then you go up again by following about 200 brick steps. Some 30 minutes later you get to a small, green plateau. A little further on you reach a rocky spot, where you keep to the left. The trail gets very stony again and it runs in between walls. There are also a lot of bushes and even some shade now and then – this is really exceptional on the Cycladic isles. Another 10 minutes later you get to some more open terrain, next to the small church of Agia Barbara; you can now spot Agios Theologos straight ahead. Immediately past the church you have to open an iron gate and you continue for the next 5 minutes over some fairly open terrain – everywhere around you can hear the sound of goats. At a kind of crossing and near a stable painted in white you can turn left to visit the Byzantine monastery of Theologos (5 minutes). The location of this monastery is marvellous, the building is impressive: there are huge foundations like fortifications and a couple of outhouses. In these outhouses pots and potatoes are waiting for the pilgrims. The church is very beautiful, with nice brick arches, an altar on an old pillar and some fairly well preserved wall paintings. On the outside there is a fantastic view on the massif of Kroikelos and on the coast. A couple of workers give us refreshing water and some loukoum; we eat in the shade of an outhouse with an oven. 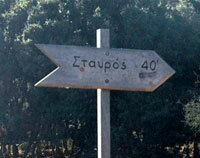 Turn right at the signpost (Stavros 40′) and follow the narrow trail. After 50 metres you can go left, through a breach in the wall. You go straight towards the east and you walk over some open terrain for a couple of hundred meters, until you get against a large wall. You can also stay in between the walls on the somewhat overgrown path and curve to the left along the wall a little further on. You then climb up rather steeply, on the left-hand side of the wall. Some 5 minutes later on you have to keep following the wall, you do not turn away from the wall. After about 10 minutes, though, you do get away from the wall; you then follow a trail with loose stones and large blue dots. You continue for about 15 minutes, by going up gradually. You walk on a fairly open and bare slope of a hill and behind you there is a marvellous view on the Agios Theologos. This is not for vertigo sufferers! All of a sudden you get a great view on the rocks and the sea deep underneath. You can also see the continuation of your trail on the right, clung to the hill side. You go on for another 20 minutes, walking in an impressive landscape at an altitude of 550-600 meters above the rustle of the sea. Suddenly, after a curve, you discover the modest chapel of Stavros. This chapel is very nearby now and it is almost dug into the rock. The chapel itself is locked and only on the 13th and 14th September this place gets more lively because of a pilgrimage. The rest of the year this is a desolate spot, especially when it is windy. Take a look at the Facebook album and see more beautiful pictures! Katsaros October 12, 2010	Log in to reply. To make a round trip, it’s also possible to reach the Machos mills and then Langada from the Krikellos’ summit, along the ridge. Not an easy way, but with spectacular views above Egiali valley. erwin October 15, 2010	Log in to reply. the round trip to the macho must be great. soon we get a description from a young person who walked down to the bauxite mines.